$1.49 EACH. Sold in quantities of 50 units per box, BOX $74.50. Holder will display a 5.5”W x 3.5”H sign. Fits most standard 1.25” shelf channels. Made of heavy, clear butyrate. $2.49 EACH. Sold in quantities of 50 units per box, BOX $124.50. Holder displays a 5.5”W x 3.5”H sign. Fits most standard 1.25” shelf channels. Ratchet feature enables ideal position for perfect view. Made of clear butyrate. $.75 EACH. Sold in quantities of 50 units per box. BOX $37.50 Ball joint allows holder to be adjusted to any angle. Extra strong springs prevent sign tilt or fall out. Overall height 3.5". Made of durable plastic. $1.89 EACH. Sold in quantities of 50 units per box, BOX $94.50. Ball joint allows holder to be adjusted to any angle. Extra strong springs prevent sign tilt or fall out. Overall height 4". Made of durable plastic. $1.99 EACH. Sold in quantities of 50 units per box, BOX $99.50. Ball joint allows holder to be adjusted to any angle. Extra strong springs prevent sign tilt or fall out. Overall height 6.25". Made of durable plastic. $.99 EACH. Sold in quantities of 50 units per box, BOX $49.50. 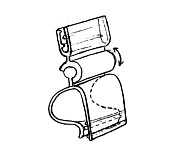 This sturdy swivel clip displays signs to .080” thick on baskets and bowls. Ratcheting design enables precise positioning for ideal view. Overall height 2". Made of clear polypropylene. $3.99 EACH. Sold in quantities of 10 units per box, BOX $39.90. Holder displays a 11"W x 7"H sign on wire shelving or wire display bin. Sign holder attaches with supplied snap rings. Made of .030 clear vinyl. Vinyl shovel sign holder - 11"x 7"
$3.99 EACH. Sold in quantities of 10 units per box, BOX $39.90. Holder displays a 11"W x 7"H sign. Can sit upright on shelf or table or hang down in front of shelf. Made of .030 clear vinyl. This versatile holder ensures signs hang straight for a clean look. Vinyl shovel sign holder - 5.5"x 3.5"
$1.99 EACH. Sold in quantities of 25 units per box, BOX $49.75. Holder displays 5.5"W x 3.5H sign. Can sit upright on shelf or table or hang down in front of shelf. Made of .030 clear vinyl. This versatile holder ensures signs hang straight for a clean look. Wooden produce bin sign holder 11" x 7"
$2.99 EACH. Sold in quantities of 10 units per box, BOX $29.90. Holder fits securely over .75 wide top edge of wooden produce bin and displays a 11”Wx7”H sign. Made of .030 clear vinyl. Fits most bins made from .75” wood. Wooden produce bin sign holder 5.5" x3.5"
$1.99 EACH. Sold in quantities of 25 units per box. BOX $49.75. Holder fits securely over .75 wide edge of wooden produce bin and displays a 5.5”Wx3.5”H sign. Made of .030 clear vinyl. Fits most bins made from .75” wood. Acrylic T-shaped sign holder - 11"x 7"
$6.79 EACH. Sold in quantities of 10 units per box, BOX $67.90. Holder displays 11”W x 7"H (landscape) sign on counter or tabletop. Slot at base for convenient sign removal. 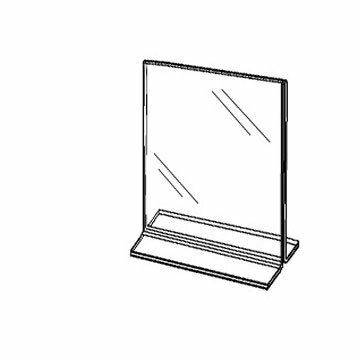 Heavy duty, 1/8" thick, made of crystal clear acrylic. Acrylic T-shaped sign holder - 11"x 8.5"
$6.79 EACH. Sold in quantities of 10 units per box, BOX $67.90. Holder displays 11"W x 8.5"H (landscape) sign on counter or tabletop. Slot at base for convenient sign removal. Heavy duty, 1/8" thick, made of crystal clear acrylic. Acrylic T-shaped sign holder - 8.5"x 11"
$6.79 EACH. Sold in quantities of 10 units per box, BOX $67.90. Holder displays 8.5"W x 11"H (portrait) sign on counter or tabletop. Slot at base for convenient sign removal. Heavy duty, 1/8" thick, made of crystal clear acrylic. $4.99 EACH. Sold in quantities of 10 units per box, BOX $49.90. 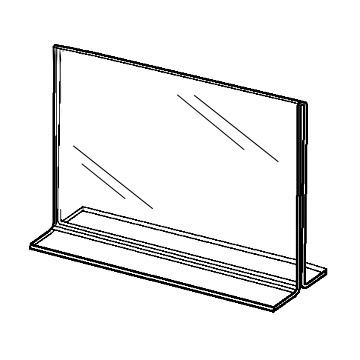 Frame displays a 7” x 11” sign horizontally or vertically on counter or tabletop. Interchangeable components easily snap together. Made of durable, high-impact polystyrene. $4.99 EACH. Sold in quanities of 10 units per box, BOX $49.90. 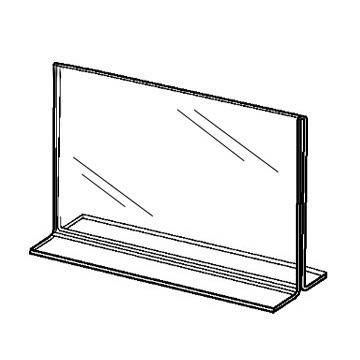 Frame displays a 7” x 11” sign horizontally or vertically on counter or tabletop. Interchangeable components easily snap together. Made of durable, high-impact polystyrene. $4.99 EACH. Sold in quantities of 10 units per box. BOX $49.90. Frame displays a 7"x 11" sign horizontally. 10" stem, overall height of 17.5". Made of long lasting black metal. $13.80 EACH. Sold in quantities of 10 units per box. Box $138.00. Displays a 11”x7 “sign horizontally. Heavy duty clear vinyl displays sign with a clean, high end look. $68 EACH. Sold in quantities of 1 per box, BOX $68. This attention-grabbing display has a matte black finish with heavy weight construction. Slot at top allows a one or 2-sided sign to be easily slipped in. Holds 22"x28" signs to .25" thick. Overall size is 22.25"x60". Ships flat; easy to assemble. $1.99 EACH. Sold in quantities of 25 units per box, BOX $49.75. 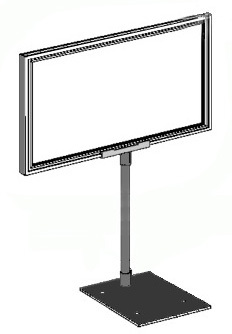 Easel displays signs to .080” thick on any flat surface. Slant-back design for better viewing. "Super gripper" holder ensures signs hold firmly and do not tilt. Made of clear polypropylene. $1.99 EACH. Sold in quantities of 25 units per box, BOX $49.75. 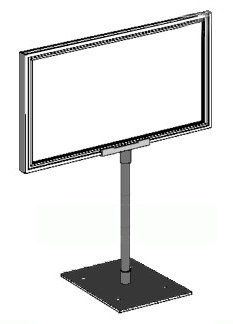 Easel displays signs to .080” thick on any flat surface. 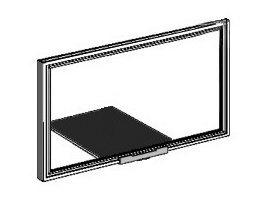 Slant-back design for near horizontal viewing. "Super gripper" holder ensures signs hold firmly and do not tilt. Made of clear polypropylene. $.90 EACH. Sold in quantities of 25 units per box, BOX $22.50. 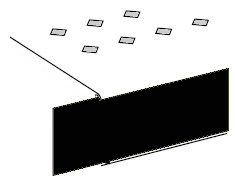 Wide base with permanent adhesive strip to attach to table or wall. "Super gripper" securely holds sign to .080" thick. 3" length; made of clear PVC. $3.80 EACH. Sold in quantities of 25 per box. Box $95.00. Great for counter, deli and cheese cases. Made of glossy black metal. Wire ring at top holds sign securely. $4.08 EACH. Sold in quantities of 25 per box. Box $102.00. Holder will display a 5.5”W x 3.5”H sign. Fits most standard 1.25” shelf channels. Made of heavy, clear butyrate. $4.45 EACH. Sold in quantities of 25 per box. Box $111.25. Great for counter, deli and cheese cases. Made of glossy black metal. Wire ring at top holds sign securely. $.49 EACH. Sold in quantities of 25 units per box, BOX $12.25. 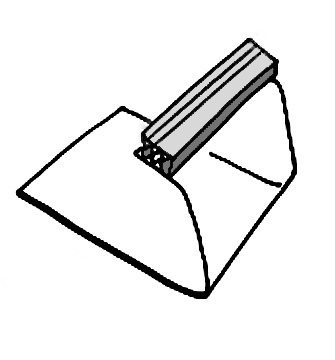 Holds sign in flush position; mounts to non-porous surface. "Super gripper" ensures signs are held securely. Holder displays card to .080" thick. 1" suction cup and 1" sign grip. $.21 EACH. Sold in quantities of 50 units per box, BOX $10.50. Holder displays signs to .080" thick. 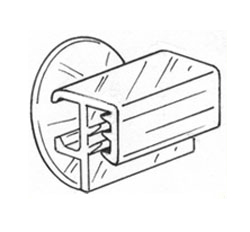 Holder attaches to wire basket or shelving. 1/2" width. Made of clear polypropylene. $.49 EACH. Sold in quantities of 50 units per box, BOX $24.50. Holder clips on to wire, bins, deli bowls, cartons, and more. Displays signs to .080" thick. "Super gripper" ensures signs are held securely. 1.5" width. Made of clear polypropylene. $.22 EACH. Sold in quantities of 100 units per box. BOX $22.00. Holder displays sign to .040" thick in a flag position, snaps directly into most standard 1.25" shelf channels. Super Gripper teeth hold sign securely. Made of natural polypropylene. $.17 EACH. Sold in quantities of 100 units per box, BOX $17.00. Holder displays sign to .040” thick in a flush or flag position, snaps directly into most standard 1.25” shelf channels. Made of natural polypropylene. $.19 EACH. Sold in quantities of 100 units per box, BOX $19.00. Holder displays signs to .012” thick securely in the flag position. Snaps directly into most standard 1.25” shelf channels. Made of natural polypropylene. $.14 EACH. Sold in quantities of 100 units per box, BOX $14.00. Label holder attaches quickly and securely to all wire shelving. 3" width. Made of clear polyproylene. $3.49 EACH. Sold in quantities of 25 units per box, BOX $87.25. Strip secures to perforated shelves or can hang on a wire power wing. Designed for heavier merchandise. Beige enamel finish with 12 clips. $.99 EACH. Sold in quantities of 25 units per box, BOX $24.75. 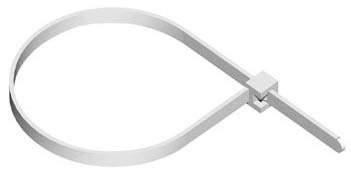 Strip has a "locking feature" and 3"W x 1-3/8"H header, 24" long with 12 locking hooks. Metal "S" hook for hanging is included. Can be inserted into perforated shelving as well as many other locations. Made of heavy duty plastic, natural color. $.60 EACH. Sold in quantities of 25 units per box, BOX $15.00. This black plastic molding strip is used in a standard 1.25” shelf channel to add a clean, contemporary look. The strips are 4 feet long and easy to install. Also available in green and red. $.60 EACH. Sold in quantities of 25 units per box, BOX $15.00. This green plastic molding strip is used in a standard 1.25” shelf channel to add a clean, contemporary look. The strips are 4 feet long and easy to install. Also available in black and red. $.60 EACH. Sold in quantities of 25 units per box, BOX $15.00. This red plastic molding strip is used in a standard 1.25” shelf channel to add a clean, contemporary look. The strips are 4 feet long and easy to install. Also available in black and green. $.60 EACH. Sold in quantities of 25 units per box, BOX $15.00. This white plastic molding strip is used in a standard 1.25” shelf channel to add a clean, contemporary look. The strips are 4 feet long and easy to install. Also available in red, black and green. $.22 EACH. Sold in quanities of 20 units per box, BOX $4.40. These versatile rings can be used if replacements are needed for our vinyl basket sign holder. $.13 EACH. Sold in quanities of 20 units per box, BOX $2.60. 8" white plastic locking straps for vinyl basket sign holder when permanent attachment is needed. Units start at $75. Call for pricing.Designed for retailers who sell products directly from pallets. 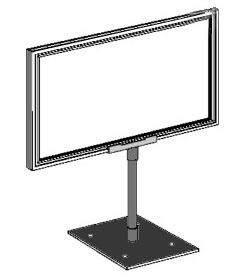 This heavy duty unit can display either a POS sign or a message with flip price numbers. 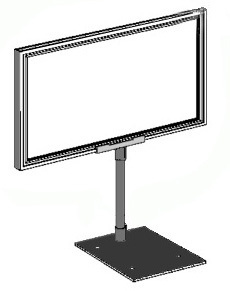 Download more information on the Power Pallet Sign System.